Over one-third of the South African population comprises of children and millions of them do not have access to the basic right of quality education. Love-a-School campaign is one of the fundraising events by the Adopt-a-School Foundation created to be a positive force, in changing the future of education in South Africa. Love-a-School campaign is one of the fundraising events by the Adopt-a-School Foundation created to be a positive force, in changing the future of education in South Africa. 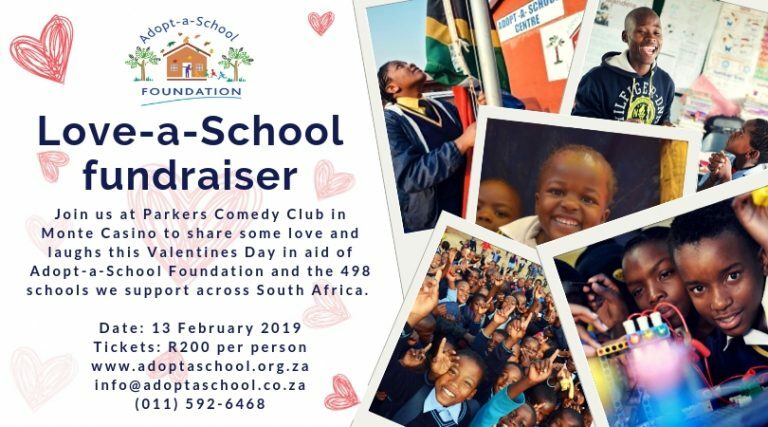 On the 13th of February 2019, the Foundation will be hosting the Love-a-School comedy night at Parker’s Comedy and Jive, Montecasino from the 18:00 till late, tickets are already available on Quicket at R200 per person. We will update the line-up on Quicket closer to the time, keep an eye on our social media pages for competitions and more information about this initiative. Raffles and prizes will be up for grabs on the night, purchase your ticket now by visiting https://www.quicket.co.za/events/64055-love-a-school-fundraiser/#/. The aim of this fundraising campaign is to create awareness around the work of the Foundation and to cultivate a love of education and giving back to the communities we operate in across South Africa. We look forward to connecting and hosting you at Parker’s Comedy and Jive. From humble beginnings, the Foundation has grown exponentially. With four hundred and ninety-eight schools spanning the entire country, making a sustainable difference in the lives of hundreds of thousands of learners, their families and their communities. Through a holistic, inclusive model called Whole School Development, the Foundation addresses the academic, infrastructural, social welfare and leadership environments in adopted schools, to ensure that the schools are conducive to teaching and learning. Through this holistic approach, the Foundation is able to address most obstacles that stand in the way of providing quality education. Schools supported by the Foundation are the least resourced and most marginalised schools in the country, but as long as there is a passion and a commitment to education, together with partners, we are able to bridge many of these gaps. The funds raised will ensure that the Foundation continues its great work, ensure to be part of this campaign and support education. Find us on the following: www.adoptaschool.org.za, Facebook: @adoptaschoolfoundation, Twitter: @AdoptaSchoolSA for more information about the foundation and future events.